LOBO stands for Lender Option Borrower Option. A LOBO loan is typically a very long-term loan – for example 40 to 70 years. The interest rate is initially fixed, but the lender has the “option” to propose or impose, on pre-determined future dates, such as every 5 years, a new fixed rate. The borrower has the ”option” to either accept the new rate or repay the entire loan. If the local authority chooses to repay the loan early (for example to access a cheaper rate loan elsewhere) it would need to pay a “break penalty” to exit the loan, which given the pricing of derivatives in the contracts can cost multiples of the original loan principal. The starting interest rate of a LOBO loan is usually quite low, designed to undercut PWLB loan rates, and is known as a “teaser rate”. Due to the complexity and “optionality” of the contracts, the overall interest rate of the loan is difficult to price over the long term, without sophisticated pricing tools that the majority of Local Authorities will not have direct access to. With LOBO loans, Local Authorities are replacing safe fixed rate 50-year loans from Central Government with new variable rate loans that could end in 5 years time and need to be repaid in full. This creates a significant refinancing risk for Council that could have drastic effects in the present context of recent austerity cuts. 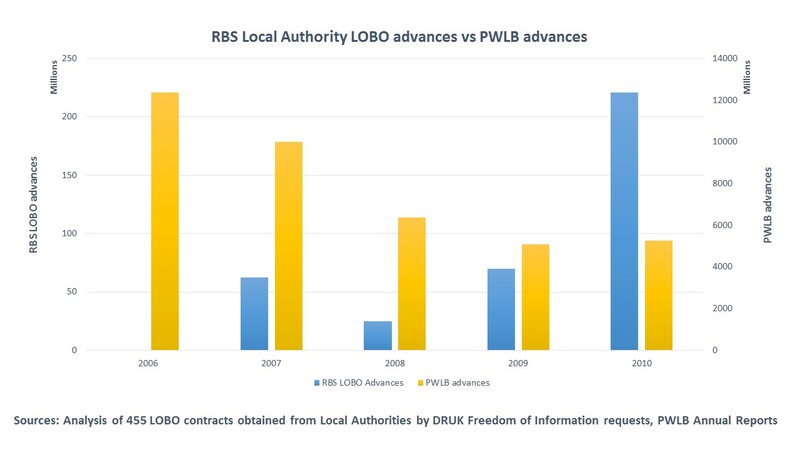 For these reasons, financial advice to local authorities suggested no more than one third of council debt should be held in the form of variable rate LOBOs. Despite this advice, some councils including Manchester Council have gone and borrowed 100% of their funds in LOBO loans from banks.